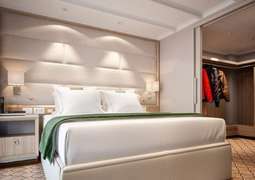 Having undergone extensive refurbishment, guests can expect nothing but the highest quality and luxurious accommodation when sailing on the Silver Cloud Expedition. 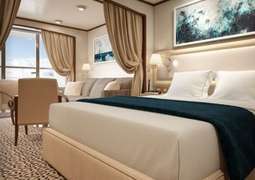 There are eight different Suite types on board ranging from the Vista Suite to the luxurious Owner's Suite. Eighty percent of the Suites offer a veranda to allow guests to soak up the fantastic scenery. Each Suite offers top class amenities such as marbled bathrooms and butler service. There is an endless selection of premium specialty restaurants to satisfy your dining desires on board the Silver Cloud Expedition. "La Terrazza" is home to the finest Italian cuisine and expert chefs will be sure to serve revered sumptuous dishes using the freshest and most authentic ingredients. Silversea have collaborated with chefs from "Relais & Châteaux" in order to ensure that culinary excellence awaits passengers on board. Guests can enjoy Asian, French and Italian cuisine on board or enjoy some relaxed dining at the outdoor bar and grill. Silversea has truly covered every angle when it comes to your dining experience. The Show Lounge provides the perfect setting for screenings and lectures, all of which are conducted by on board experts. The "Panorama Lounge" combines stunning views with a relaxed atmosphere. Guests can enjoy a spot of lunch, watch the sunset or later in the evening, enjoy live music and dancing. Guests can also find a card room on board which can be used to play bridge and more as well as doubling up as a conference room, if needed. 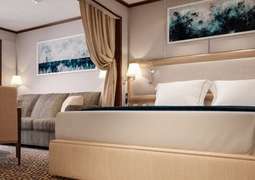 There is also a library, beauty salon and internet cafe on board, allowing guests to relax while also staying up to date with events. The Silver Could Expedition offers a fully-equipped fitness centre for more active guests. There are a number of fitness classes available also, at no extra cost. There is an outdoor pool with whirlpools and a large outdoor Sun Deck for guests to enjoy and bask in the sun. You also have the option to unwind at the on board Spa.